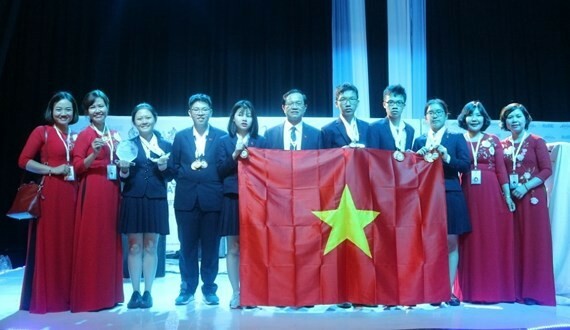 All the Vietnamese contestants at the 15th International Junior Science Olympiad (IJSO) captured high prizes from the competition after 9 year participation, the Department of Education and Training in Hanoi said yesterday. Nguyen Manh Quan, Vu Quynh Chi, Nguyen Tran Mai Phuong and Nguyen Le Thao Anh each brought home a gold medal from the competition held in Botswana from December 2-10 while their peers Tran Dinh Quan and La Trieu Duong attained two silvers. They are all tenth graders of the Hanoi Amsterdam High School for the Gifted. 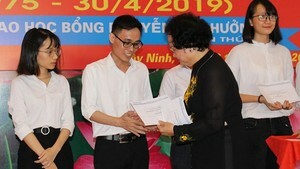 Moreover, Nguyen Manh Quan earned the individual excellent prize in the theorical category. Vietnamese students including Nguyen Le Thao Anh, Vu Quynh Chi and La Trieu Duong secured the gold medals in the practice category. With the achievements, the Vietnamese team claimed a bronze medal in the Olympiad. This is the ninth years Hanoi selected students for the competition. After two rounds, six good students of the Hanoi Amsterdam High School for the Gifted were chosen for the competition. IJSO 2018 is the fifth competition in science with the participation of 276 students from 44 nations and territories. The annual competition is held to promote interest in science among school students at the age of 15 or younger. Held for the first time in Jakarta, Indonesia in 2004, IJSO has been hosted in different countries around the world to challenge and encourage students to access to scientific knowledge in the world. Contestants must complete three tests inclusive of multiple choice examination, theoretical examination and practical examination. The competition also offers educators a chance to share their experiences to improve education quality and accelerate global science education.